Lifestyle Blog of Rachel, based in Leeds, Yorkshire. UK RAF WAG, lover of Harry Potter, cake and having fun! This weekend myself and Rich found ourselves with a weekend of no visitors and no plans, which hasn't happened in a really really long time for us! We recently bought a new DSLR as a present to us both for Christmas, and to help me take better photos for this little blog. So we thought we'd take it out for a play to Tropical World in Leeds, as I'd heard it was really good. It's admission price is really cheap to get in at £3.40 for an adult, so we weren't expecting much, but it surpassed my expectations by far! If you've ever been to the Eden Project in Cornwall, it follows a similar theme to that, except it has animals in it as well as plants. After walking past the first exhibits - which had massive tarantulas in it - very very quickly (Rich is terrified of spiders, so tarantulas as big as his face aren't something he wants to pay to see, unsurprisingly), we headed into the first area, which was tropical, and full of butterflies. As I was wearing a bright top they seemed to absolutely love me and kept flying in my direction and landing on me, which was an amazing experience. 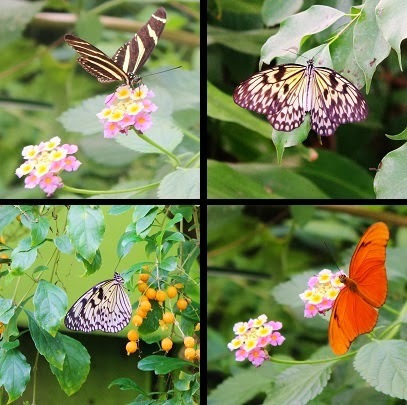 These aren't just your standard butterflies, they are huge and such pretty colours. After this area we headed into the next zone which was the desert area and had Meercats in it! Unfortunately they weren't speaking in Russian accents, but they were being very cute, and as Rich was taller than the glass around the enclosure, he got some amazing pictures. There were birds flying around as well, and having a munch on the food that was out for them, and there were some really unusual ones and cute ones. If anyone can identify the pinky orange bird please let me know in the comments. There were info boards by the exhibits, but as the birds and butterflies were free to roam throughout the exhibits it was hard to remember all their names and information! After we had melted ever so slightly walking around Tropical World (if you ever go in winter, wear layers, as it's about 28 degrees in the zones) we headed for a walk around the gardens which surround it. They were free to walk around, and really picturesque, even in autumn. I love my new jumper from Dorothy Perkins, it fits really snugly, and looks smart, but is really comfy. It's also easy to dress up for work, and down for a rock chick weekend look. It's also long enough in the sleeve and the length for me, which is rare for standard range clothes. What have you been up to this weekend? Have you ever been to Tropical World? Let me know below! Aww I love Meerkats - they are so cute. Have to say I'm not so keen on ones with Russian accents though! Sounds like such a lovely day out, and so cheap too! Those meercats are the cutest! Eating all the cake whilst waiting for my Hogwarts letter to arrive. © The Inelegant Wench. All rights reserved.